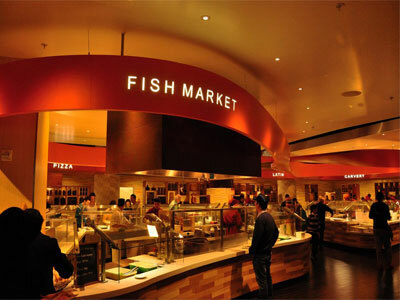 Enjoy The Buffet at Aria with its newly revamped decor and food stations. A wide variety of choices are prepared right before your eyes to make for a hot, fresh personalized meal! Choose from Asian, Italian, Tandoori, Latin, seafood, Mediterranean and more! An entirely new way to buffet is at Aria. The newly revamped Buffet is not your pre-made, reheated food sitting in warmers. This buffet offers a true Vegas-style experience with chefs carving, steaming, baking and sautéing your choices right before your eyes. Experience the naan or kebabs straight from the Tandoor oven, or the new Fish Market with crab legs, stews, mussels, cioppino and fish and chips. Eleven stations in all will tempt you with Mediterranean, Italian, Asian and Latin cuisines. The Carvery offers smoked, grilled and BBQ meats while the Diner can feed your craving for some comfort food. The chefs can even prepare a special order of your favorite platter for large groups! Fill your plate and enjoy the views of Aria’s courtyards and pools while you contemplate your second round! You will be sorry if you do not leave room for the enticing dessert selections prepared by Jean-Philippe Maury, so plan accordingly. Add $19.99 and 2 guests enjoy unlimited mimosas, Bloody Mary’s, champagne, premium beer and wine on tap and rum punch. We got to the buffet expecting to pay $34 a person and they charged us $47 a head. Kids are the same price as adults. The sushi is not good (old). Most of the other food was good. Service is so so. We go here every time we go to vegas. Great spread! So while the food and selection are great, we were shocked and very offended when , after each of our three groups each paid to get it to the buffet, the hostess walked over to find put how many in our party. Upon telling her eleven – her immediate response back was I will not seat you until you pay for the gratuity for the whole party now. She told us to go back to cashier and pay it and walked away. Unbelievable rudeness.